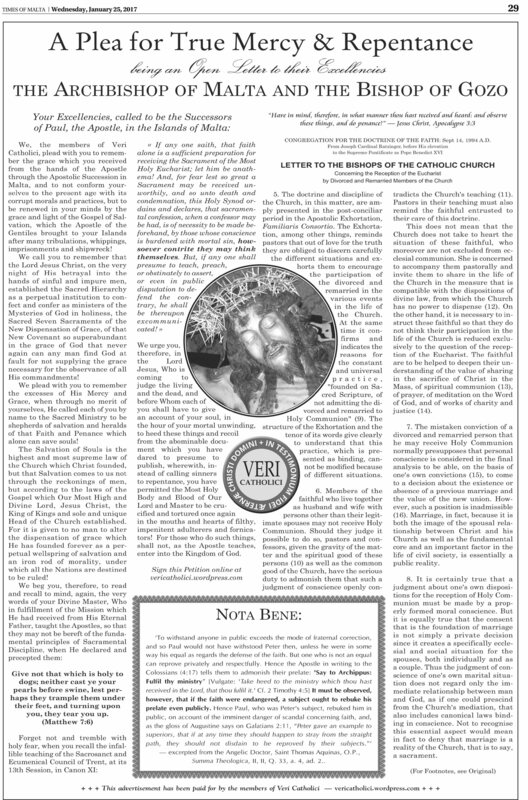 On Wednesday, January 25, 2017, Veri Catholici, the International Association of Catholics for the Defense of the Faith against the Errors of Cardinal Kasper, published in the Times of Malta Newspaper, on p. 29, an Open Letter to the Bishops of Malta and Gozo regarding their recent pastoral document, in which they have openly approved of communion for those living in public sin. The Republic of Malta, one of the smallest Nation States of the European Union, is a Republic consisting of numerous islands, the largest two of which are Malta and Gozo. The Archbishop of Malta is Msgr. Charles Jude Scicluna, a native of Canada; the Bishop of Gozo is Msgr. Mario Grech, a native Maltese. The Archbishop, like all the principal members of “Team Bergoglio”, traces his episcopal lineage back to the notorious Mariano Cardinal Rampolla del Tindaro, rival of Pope St. Pius X in the Conclave of 1903. Those wishing to sign the open Letter may do so by leaving a comment below this post, indicating their name, and the town in the Republic of Malta, where they reside. If you reside outside of Malta, please mention also your nation. If you wish to help with the costs of running the Advertisement in the Maltese Paper, please use our PayPal Button in the Right column of this page. Thank you! — Note: now that the Advertisement has been published, on page 29 of the Wednesday, Jan. 25th edition of the Times of Malta, we encourage all to purchase a copy.